More news: In June, Midway Radicals & Archi-Poems was shortlisted for the Lansdowne Prize for Poetry. A place for thinking things otherwise and more desirable than they sometimes seem. It is an open investigation into the reasons for being of poetic places; places that have locations but transcend them in some way; they are common yet uncommon places. Welcome. 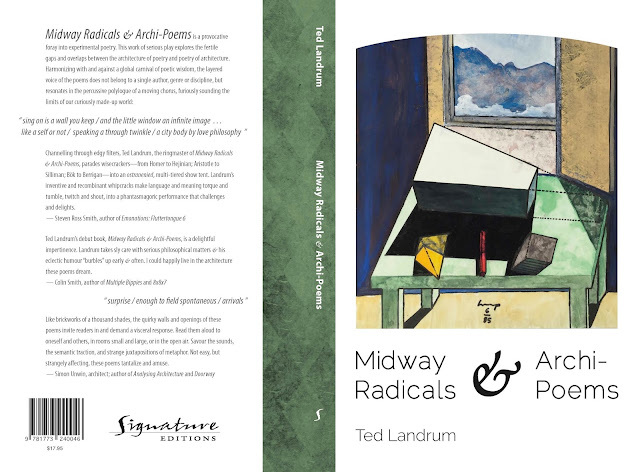 This site is the creation of Ted Landrum, self appointed Archi-Poet - a maker of Archi-Poems called Midway Radicals. The work done here is part of ongoing research probing the productive terrain between architecture, poetry, philosophy and art. In other words, Ubu Loca is an archive of "man-made dreams produced for those who are awake."